The Call for Papers for NVJS 11 is now closed. Details of the most recent CFP are retained below for reference only. If you intend to submit to a future volume, please be sure to consult the updated eligibility criteria and guidelines for that volume. Subscribe to our newsletter to be notified of the next Call for Papers. 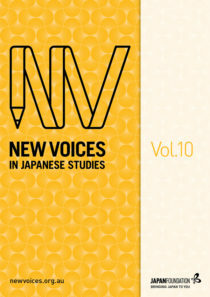 New Voices in Japanese Studies has opened its second-round call for papers for Volume 11, scheduled for publication in mid-2019. NVJS is a peer-reviewed open-access journal showcasing outstanding Japan-related research by emerging scholars with ties to Australia and New Zealand. NVJS accepts submissions from Honours graduates, Master (Research) graduates, PhD candidates and recent PhD graduates in or from Australia or New Zealand. Postgraduates and new PhD graduates from outside of Australia and New Zealand who have recently presented at selected area studies conferences in Australia are also eligible to submit. For details, see the Eligibility Criteria below. What kinds of submissions does NVJS accept? Papers must be original, unpublished sole-authored work of 5,000–8,000 words in length, written in English, and from the humanities or social sciences (or a related discipline) with a focus on Japan. For details, see the Submission Guidelines. From Volume 11, NVJS will trial a new Reviews section. Reviews should be approx. 1,000 words in length (600-800 words for article reviews) and focus on a publication that meets the criteria on the Review Guidelines. All academic papers submitted to New Voices in Japanese Studies are rigorously reviewed internally by the Guest Editor and Series Editor, and independently double-blind peer reviewed by at least two experts in relevant fields prior to publication. See the Editorial Process for further details. Reviews are reviewed internally by the Guest Editor and Series Editor. External expertise may be sought as required. To see if you are eligible to submit to NVJS, choose the tab that best represents your current (or most recent) university enrolment status and check the criteria. As an Honours-level contributor, you are eligible to submit if you and your work satisfy each of the criteria (1– 4) below. be/have been enrolled at an Australian or New Zealand university for the period of your Honours candidature. be referenced and formatted according to the NVJS Style Guide (available in the Submission Package). *Note: These guidelines apply to Honours graduates only. Master graduates, PhD candidates and recent PhD graduates should refer to the specific guidelines for their category. As a Master-level contributor, you are eligible to submit if you and your work satisfy each of the criteria (1–4) below. be/have been enrolled at an Australian or New Zealand university for the period of your Master candidature. be referenced and formatted according to the NVJS Style Guide (included in this submission package). *Note: These guidelines apply to Master graduates only. Honours graduates, PhD candidates and recent PhD graduates should refer to the specific guidelines for their category. As a PhD candidate, you are eligible to submit if you and your work satisfy each of the criteria (1 – 4) below. be/have been enrolled at an Australian or New Zealand university for the period of your PhD candidature. *Note: These guidelines apply to PhD candidates only. Honours graduates, Master graduates and recent PhD graduates should refer to the specific guidelines for their category. As a recent PhD graduate, you are eligible to submit if you and your work satisfy each of the criteria (1 – 4) below. an Australian or New Zealand citizen or permanent resident who graduated with a PhD (from any university) in 2017 or later. a PhD graduate (of any nationality) who was awarded their PhD from an Australian or New Zealand university in 2017 or later. *Note: These guidelines apply to recent PhD graduates only. Honours graduates, Master graduates, PhD candidates and Graduate Workshop participants should refer to the specific guidelines for their category. As a postgraduate presenter at the Asian Studies Association of Australia (ASAA) or Japanese Studies Association of Australia (JSAA) conference, you are eligible to submit if you and your work satisfy each of the criteria (1 – 4) below. *Note: These guidelines apply to ASAA/JSAA Postgraduate Presenters only. Local Honours graduates, Master graduates, PhD candidates and recent PhD graduates should refer to the specific guidelines for their category. Submit a Review Proposal via our online form. ※ Eligible authors who are interested in reviewing for NVJS can also register on our Reviewer Database.